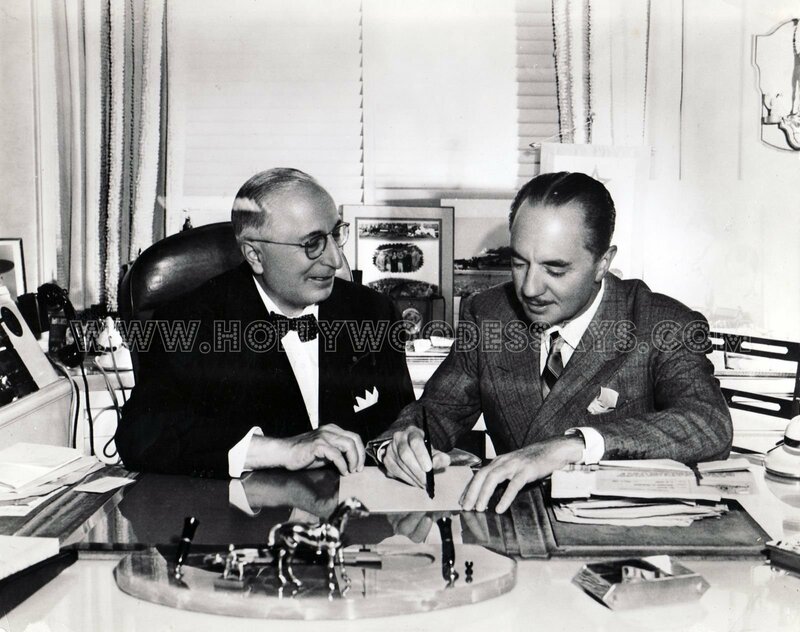 Louis B Mayer with actor, William Powell, in his office at MGM. Date unknown. UPDATE: 2 June, 2012 – When I initially added this post I didn’t know who the other man is sharing uncle Louis’ desk in his office at MGM. Thanks to my aunt who emailed me recently, I now know this is William Powell, a major star who was nominated for the Academy Award for Best Actor three times: for The Thin Man (1934), My Man Godfrey (1936), and Life with Father (1947). I love the pen holder, which of course relates to Louis B Mayer’s passion for thoroughbred race horses. Looking around there are two phones – perhaps one is an intercom? The rest is the usual flotsam and jetsam found on any busy exec’s desk today… or 70 years ago. Thanks to my aunt for clarifying the mystery of the man hot-desking with uncle Louis.